Fajitas is a real crowd pleaser. Being able to assemble the food and eat with your hands what is not to love. 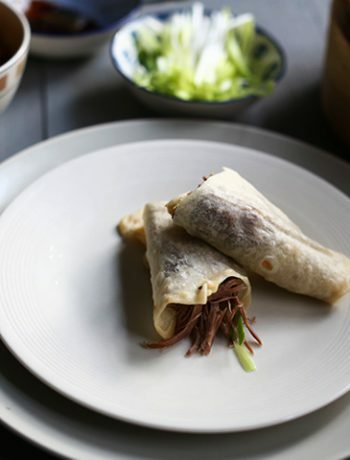 Especially if you make them with small soft fajitas tortillas. 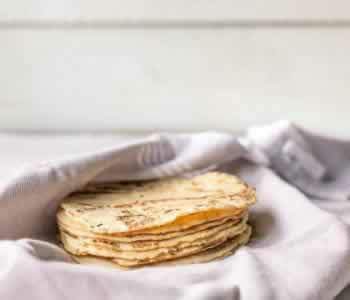 I love to make the tortillas myself. Combined with the charred peppers and onions as the base you can’t go wrong. 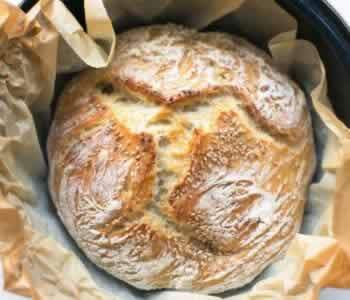 Top with your favorite ingredients and you have an simple, easy and fast recipe. 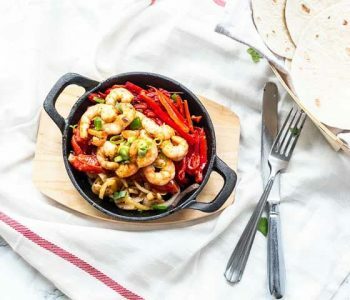 Want to know the best part of this fajitas recipe? It is done in no time. 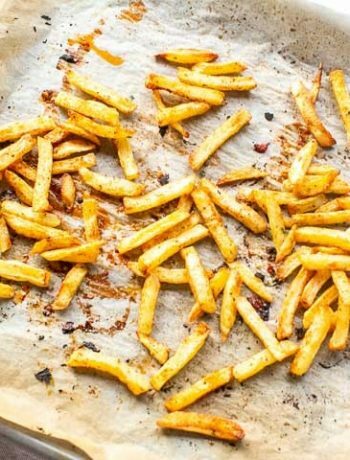 In less than 15 minutes you have this dish on the table. No reason to get into your car and drive to a restaurant honestly. Especially if you serve the fajitas in those cute mini cast iron skillets. Serve with some Mexican rice or potatoes. It is like going out to eat at home. 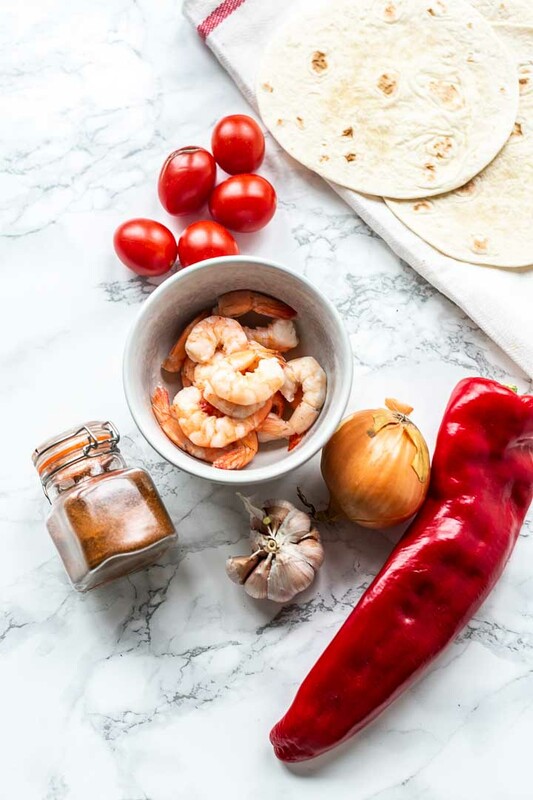 When you make this shrimp fajitas recipe start with the ingredients that take the longest to cook. In this case the peppers and onions. Heat your cast iron skillet and add the olive oil to the pan. Sauté the peppers first before adding the onion. Add the finely chopped garlic and the halved plum/cherry tomatoes when the peppers and onions are getting soft. This will take about 4-5 minutes. Stir through so the garlic is evenly distributed. Take the vegetables out the skillet and add some more olive oil in the skillet. 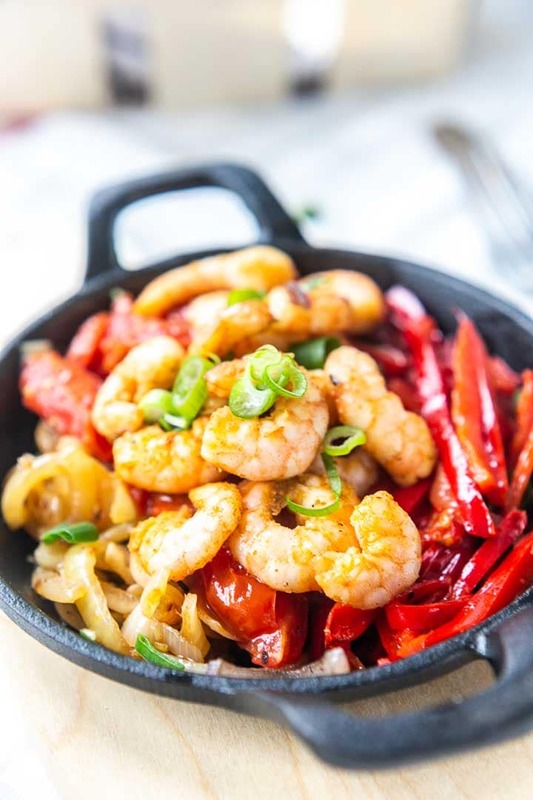 Be sure the pan and oil are hot as you want to shrimp to cook but not boil. Add the shrimp to the pan and leave them for a couple of seconds before you start stirring. You want to prevent the shrimp from sticking to the pan and tearing apart. Cook the shrimp for 4 to 5 minutes moving them around in the skillet. Add the bell pepper and onion mix and let it warm through. You can warm the tortillas either in the oven or in skillet. If you want to warm them in the oven set to 400℉/200℃ and warp the tortillas in aluminium foil. Warm for 8-10 minutes. If you want to warm them in a skillet just heat the pan and let your tortilla warm for about half a minute per side. 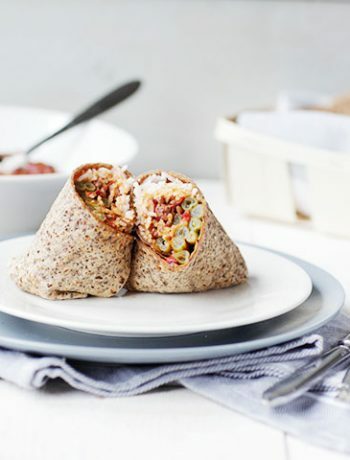 Keep warm in a tortilla warmer or in clean kitchen towel. 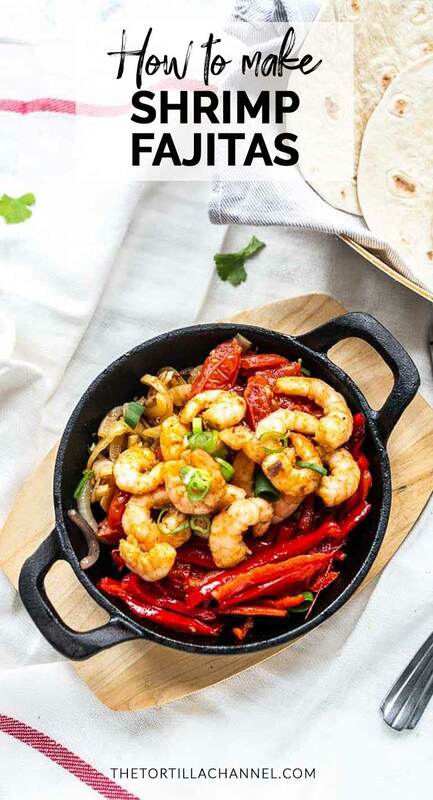 Serve your shrimp fajitas in the skillet together with the tortillas. Dinner is ready to serve. 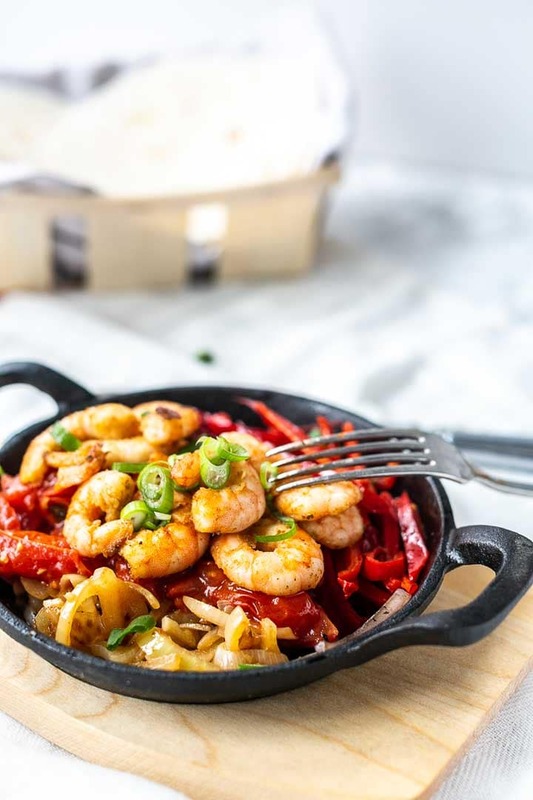 I hope you love this shrimp fajitas as much as I do. 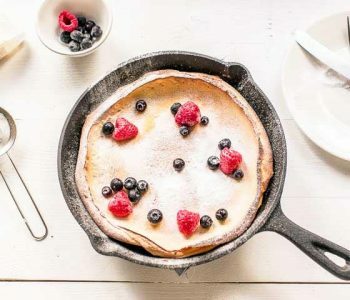 Have fun making this recipe! Made a recipe tag @thetortillachannel on Instagram or PIN on Pinterest. 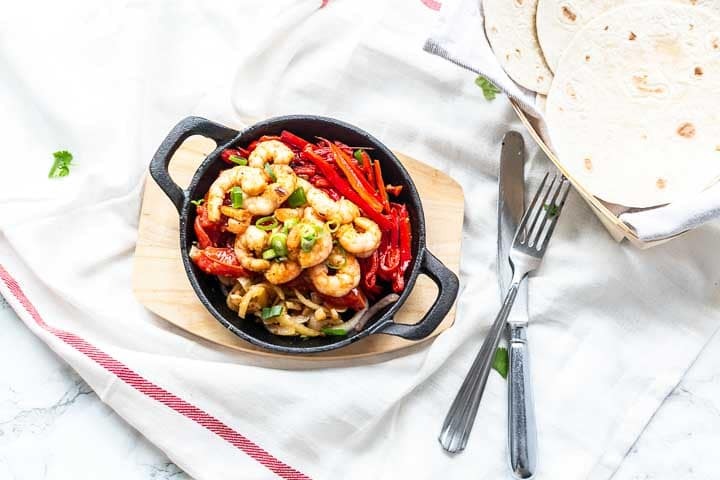 Looking for the best shrimp fajita then this recipe is for you. Simple, easy and fast. 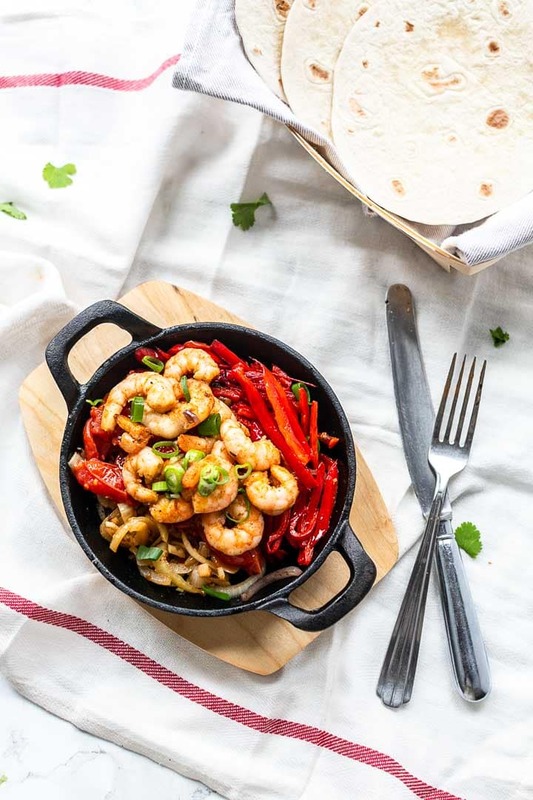 These shrimp fajitas are on the table in less than 15 minutes. We love fajitas at our house! Pinning! One of our favorites here as well! Thanks for pinning.